Before I get to the good stuff, I just want to thank everyone for their emails and comments on the loss of our family dog. It really shows me what a great blog community I am part of. Alright, on to the good stuff. 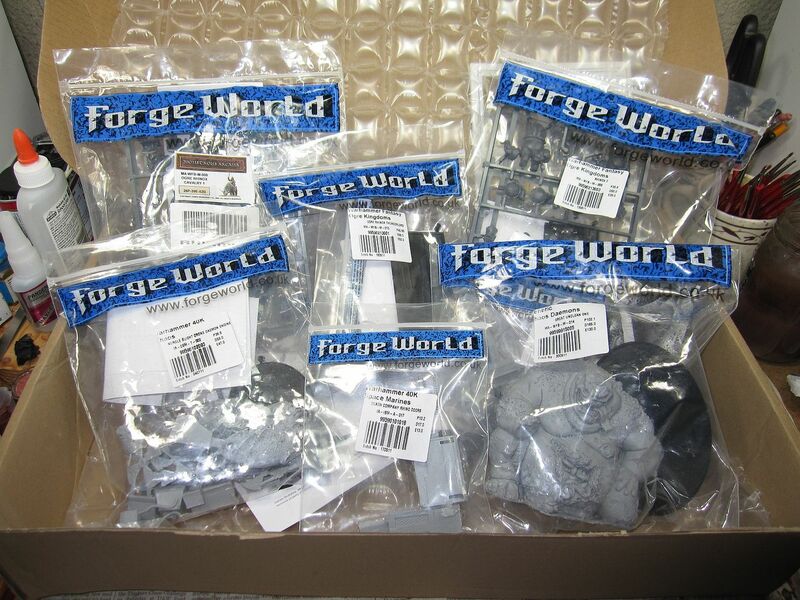 My Forge World order has arrived and here it is. It contains a Great Unclean One, my third Nurgle Blight Drone, an Ogre Kingdoms Rhinox Thunderlord and both Rhinox Riders, and a set of Death Company Rhino Doors. This order completes both my 40k Nurgle Daemon army and WHFB Ogre Kingdoms army. I am anxious to get to work on this stuff, but I have to finish painting this month's projects first. So stay tuned to see more over the next few weeks. @Da Masta Cheef: Nice, I like that model. Sadly, you reminded me that I have a Thunderbolt and Vendetta conversion in drydock as well. Man, I need to quite buying stuff.